The earlier you do tax planning, the better. Conciliation agreement didn't control dependency exemption. Bad debt deductions disallowed for family loans. Guarantee by LLC member puts member at risk. Corrections issued from Net Investment Income Regulations. FSA participant is eligible for HSA. Football scholarships might be taxable. California use tax on the Form 540 is a pill. Broadcast times change for Financial Insider Weekly. Visit our new article: No B.S. Guide to Brand-Building By Direct Response. 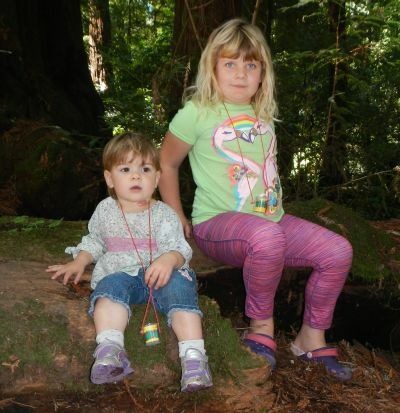 Kara and Minerva Siemer at Henry Cowell Park. Mother's Day is Sunday, May 11. Be sure to express your appreciation to the mothers in your life. Janet and I will be with our grandsons while Holly and Dan Baker serve Mother's Day dinners at MarchÃ© Aux Fleurs in Ross, California. Make your reservation now! My daughter, Holly Baker, and her husband Dan are celebrating their 15th wedding anniversary this month. Congratulations, Holly and Dan! Many people wait until the year-end for tax planning, but it's better to do it earlier in the year when it's easier to act on it. Why not make a tax planning appointment today? Call Dawn Siemer at 408-918-3162 on Mondays, Wednesdays or Fridays to make an appointment. An unmarried couple made a conciliation agreement for their child. The agreement didn't specify which parent would receive the dependency exemption. Both parents claimed the exemption for 2010 and 2011. Although the agreement seemed to imply the mother would be entitled to the exemption, the Tax Court found the child spent the night with the father the majority of the nights for those two years. Therefore, the Tax Court found the father was entitled to the dependency exemption for those years. According to the Tax Court, a taxpayer's transfers to two trusts weren't bona fide loans, so nonbusiness bad debt deductions were disallowed when the trusts didn't pay the loans. The trusts were originally created by the taxpayer for the benefit of his sons. Promissory notes were made for the loans, but there was no evidence of an attempt to collect the amounts due. In addition, nonbusiness bad debt deductions were disallowed for amounts paid on behalf of the taxpayer's mother and disabled brother for a purported indemnification agreement. The agreement was oral, so there was no physical evidence of the agreement. The IRS Chief Counsel has issued advice stating that when a member of an LLC guarantees a debt of the LLC and there is no right of contribution from members other than the LLC and the member isn't otherwise protected against loss, the member is considered to be at risk with respect to the debt. The conclusion is important, because the amount at risk gives the member an additional investment amount for which losses can be claimed. If the debt for which a guarantee is given was previously qualified nonrecourse financing (usually nonrecourse financing secured using real estate), the other members of the LLC could be considered as having received distributions of cash, which could result in their having taxable income. Business owners have to balance the tax benefits of getting deductible losses against the liability they accept, since the purpose of an LLC is to seek protection from liability. The IRS has issued corrections to the final Net Investment Income Regulations that were issued during December 2013. The corrections clarify that foreign taxes for which a deduction instead of a tax credit is claimed for regular tax reporting are also deductible when computing the net investment income tax. The National Labor Relations Board for the Chicago region recently ruled the football players at Northwestern University were employees of the school and had the right to unionize. A scholarship isn't tax-free when the grant is conditioned on providing services to the school. Therefore, it appears football scholarships (an possibly other sports?) may be taxable. California's State Board of Equalization encourages California taxpayers to pay an amount for California use tax on their individual income tax returns. The amount is for California sales tax that wasn't collected for goods purchased on the internet from an out of state vendor or for goods brought into the state and consumed in California. The problem is, if the Franchise Tax Board made any adjustment to your tax return, such as for a penalty for underpayment of estimated tax or for interest for late payment of tax, it applies the payment that you made for California use tax to their own bill. Then it forwards the use tax information to the State Board of Equalization, which then will bill you for the amount they didn't receive from the Franchise Tax Board. This is a great way to discourage people from doing the right thing, especially when the amounts are small. Broadcast times change for Financial Insider Weekly in Santa Cruz County, Watsonville & Capitola. The broadcast days and times for Financial Insider Weekly have changed to Sunday at 1 p.m. and Tuesday at 10:30 a.m. The show is broadcast on Comcast channel 26 in Santa Cruz County and Charter Communications Channel 2 in Watsonville and Capitola. May 2, 2014, Judy Barber, Family Money Consultants, LLC, "The transfer of family wealth to the next generation: What's the money for?" May 9, 2014, attorney Jeffrey B. Hare, P.C., "Legal due diligence for real estate transactions"
May 16, 2014, Phil Price, E.A., The Price Company, "Retirement plan alternatives for small businesses"
May 23, 2014, Mayuri Onerheim, "Money, Spirituality, Consciousness"
May 30, 2014, attorney Michael Desmarais, "Your rights as a beneficiary"
June 6, 2014, attorney Michael Desmarais, "Estate planning for second marriages"
June 13, 2014, attorney Jann Besson of Law Offices of Besson & Yarbrough, "Medi-CAL benefits for Long-Term Care"
June 20, 2014, Hilary Martin Hendershott, CFPÂ®, The Family Wealth Consulting Group, "Why most people will never achieve their financial goals"
June 27, 2014, Craig Martin, CFPÂ®, The Family Wealth Consulting Group, "The role of emotions in investing"